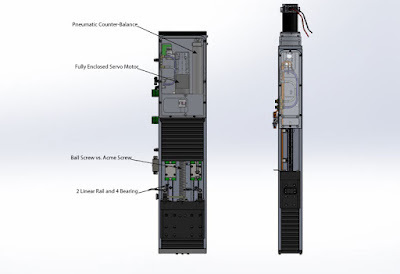 In April, we introduced you to our more robust Z-carriage for the E-Series. To give you a better idea of how this new Z-carriage differs from the standard 2D Z-carriage, WARDJet's engineering department produced a few detailed comparison images. 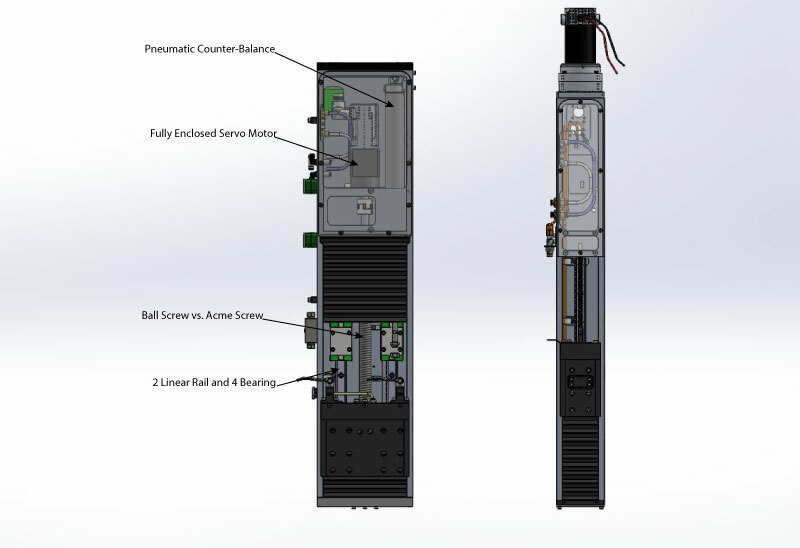 Take a look inside the new Z-carriage: it includes a pneumatic counter-balance, a fully enclosed servo motor, a ballscrew (rather than an Acme screw), and includes 2 linear rails and 4 bearings for increased stability and cutting accuracy. 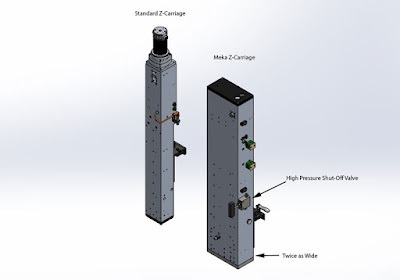 Compare the widths of the Z-carriages: on the right is the standard on the E-Series, which is 4 inches wide. On the left, you'll notice that the new, beefier build is twice as wide at 8 inches! Many of our customers have asked to be able to cut more complex geometries on a smaller footprint machine. With this 8 inch, reinforced Z-carriage, WARDJet is excited to offer increased versatility for the E-Series waterjet systems. 5-Axis cutting, manually adjusted bevel cutting and Sync-8 cutting are all possible for E-Series customers, in addition to the standard 4" Z-carriage which is an excellent, lightweight option for customers interested in no frills two dimensional cutting.